Business Book Club: Are You Fully Charged? What’s most important for your work and life? 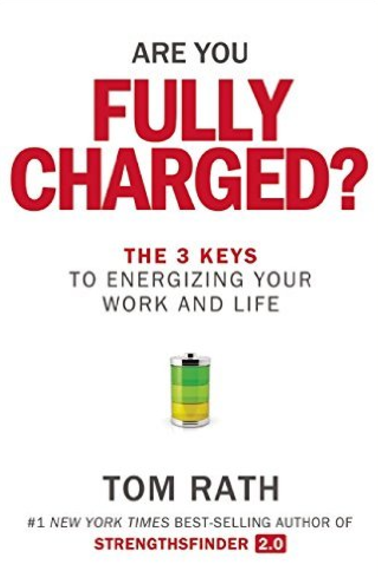 This is the question Tom Rath helps readers answer in his newest book, ‘Are You Fully Charged?’ Broken into three sections, Meaning, Interactions, and Energy, Rath explores the different ways people approach their work and life, and to what degree each of these methods is best suited for success. Even more importantly, ‘Are You Fully Charged?’ aims to help readers get themselves fully charged with helpful suggestions and action items. If one thing is for certain, it’s that ‘Are You Fully Charged?’ isn’t lacking facts. Each and every chapter is filled to the brim with examples taken from research Rath has observed, studies published in journals, and statistics highlighting the importance of Rath’s message. Whether it was a University of Michigan study that found when people were reminded of monetary rewards they were three times as likely to want to work alone, or how Rath’s own research found that people who had great interactions throughout the day were four times likelier to have higher well-being, Rath backs up every claim with many examples of research and studies proving him correct. But while each chapter had tons of information, the chapters came quickly. Rath’s book is organized well so that those wanting to skip to certain sections have no problem doing so. First and foremost, everything is set up into the main three ‘keys’: Meaning, Interaction, and Energy. But within each section, there are multiple chapters as well, each no longer than ten pages. And within chapters there are occasionally subheadings, helping a reader easily digest information. The focus on health in ‘Are You Fully Charged?‘ was also something I enjoyed. The entire second section focused on the importance of building and maintaining relationships with people. And while this is slightly similar to ‘Never Eat Alone,‘ the focus of relationships wasn’t just for the benefit of business, but for improving the self. Similar was the third section. The primary focuses were on the importance of eating right, exercising, and sleeping. Most business books neglect these topics, sticking instead to what you can do at work to improve your work life. By including the emphasis on improving your life, of which only a small part is work, Rath puts into focus what is truly important in life. Similarly, Rath makes sure any advice he gives is actionable. Within the book, he gives advice on how you can make changes and presents this language in an empowering way. Rather than focusing on how important healthy eating is, he recommends you “organize the foods in your kitchen and pantry so the best choices are most visible and easily accessible.” You shouldn’t just exercise because of the health benefits, you should “walk and stand in meetings to keep focused and energized.” And instead of talking about the benefits of sleep, Rath says to “impose a moratorium on all electronical devices in the hour before your normal bedtime.” By using commanding language, Rath makes the reader feel as though he or she can and should go out and make changes in his or her life. While Rath’s book provided great information, it at times felt as though the book was just an accumulation of facts and features on studies. And while there is no denying analysis was done, I would have liked for a more personal story element to the book. In fact one of the best parts of ‘Are You Fully Charged?’ is when Rath describes the importance of assuming good intent. He writes about how cancer left him unable to see out of his left eye, and thus he will at times accidentally collide with someone who thinks he saw them coming. He says that “each time my partial blindness leads to a collision, it gives me a little window into what’s going on in the other person’s life at that moment.” Most of the people he runs into are able to interact in a positive matter, apologizing, smiling, and shaking it off, but others assign blame and get angry. This helped Rath realize that other’s reactions have more to do with their own feelings and well-being than his. Part of the reason this part of the book stuck with me was because it was a personal experience, and I felt connected to Rath during this moment. I understood his point better because he made it personal, more than just stats and figures. I just wish Rath did this more, especially after reading ‘Predictably Irrational,’ where Dan Ariely is able to describe his research while making it feel like you are reading a novel. I also felt that Rath’s book took some time getting into. It wasn’t until after the entire first section, Meaning, that I started enjoying the book. And even then it was because I had changed my thinking of the book. Rath’s book isn’t a typical ‘business’ book as it is advertised as. It’s more about ways to improve the overall health and quality of your life, of which work is just a small fraction. But having gone into it with the mindset of learning about how to improve my work life, I felt detached, as I was reading something much different than what I was expecting. Once I realized I should treat the book as a more general life guidance book, I was able to connect with it – I just wish it had been more honestly portrayed so it didn’t take so long to get. Tom Rath’s ‘Are You Fully Charged?’ was not my favorite business book. However, I think it was a great book in terms of reassessing the way you approach life, and a good jumpstart for those looking to find meaning, cultivate relationships, and improve your health. But I would not consider this a business book, although it is marketed as one. This entry was posted in Book Review, Business and tagged are-you-fully-charged, business-book-club, business-book-review, business-books, wellness. Bookmark the permalink.